How Elvis Got his Name? Who Took the Coffin Photo? What is Elvis Memorabilia Worth? Who is Buried at Graceland? 19 December 1957: Elvis received his draft notice at Graceland. That Christmas Elvis gave Anita Wood a French poodle and his mother a pink dressing-gown, but no gift could alleviate the pain she felt. 10 March 1958: King Creole ending shooting and Elvis returned to Memphis by train. 24 March 1958: Elvis was inducted into the Army as US soldier number 53310761. 25 March 1958: Elvis was given an Army haircut at Fort Chaffee, Arkansas by James Peterson while a mass of press photographers snapped the historic moment. Elvis joked, “Hair today, gone tomorrow. 5 August 1958: Gladys was taken to Memphis Methodist Hospital. 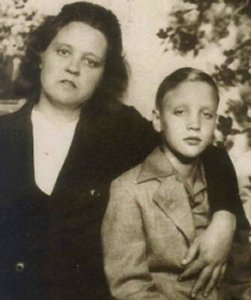 Elvis was granted a leave of absence and rushed to his mother’s bedside. 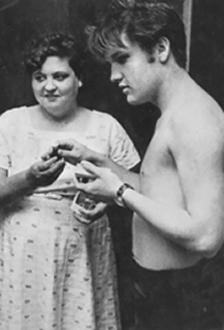 14 August 1958: Gladys Love Presley died of a heart attack in Room 688 Elvis went into a state of shock. 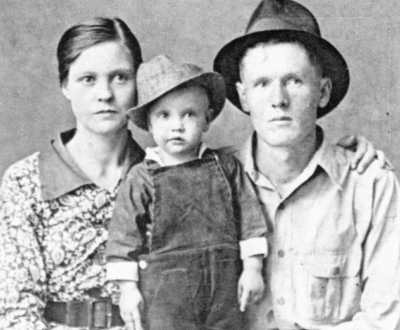 He became so distraught that the funeral directors had a difficult time to tear Elvis away from his mother’s body. He combed her hair over and over and insisted she be placed in a glass-topped casket so that he could continue to see her. 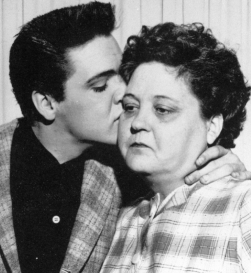 16 August 1958: Elvis was overwrought at his mother’s funeral at Forest Hill Cemetery. Gladys’ favourite gospel quarter sang Rock of Ages, In the Garden, “I am Redeemed and Precious Memories. After the funeral Elvis locked himself in Gladys’ bedroom for eight days barely eating and refusing to talk to anyone. Weeks later a marker was placed at the grave site that read.